What happened: A massive blaze at "Notre Dame Cathedral" in Paris devastated large parts of the 850-year-old church. 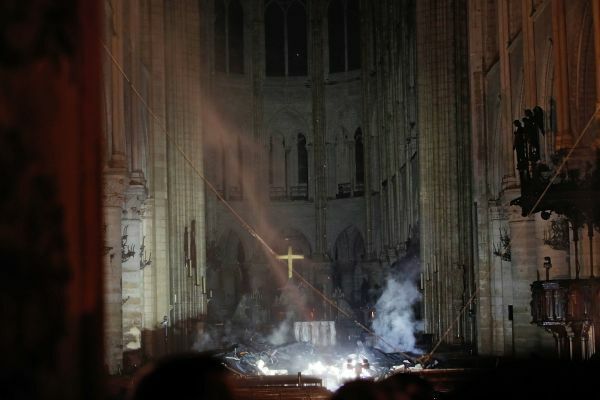 The fire is now out, but the cathedral's iconic spire fell during the hours it took to battle the blaze. 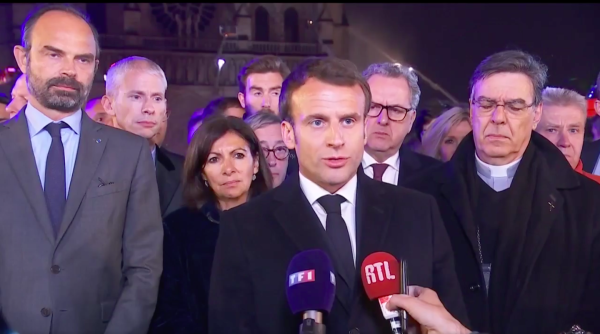 Macron: 'We will rebuild': Speaking from the scene, French President Emmanuel Macron described the fire as a "terrible tragedy," but added that the "worst had been avoided," promising Parisians that they will "rebuild this cathedral together." 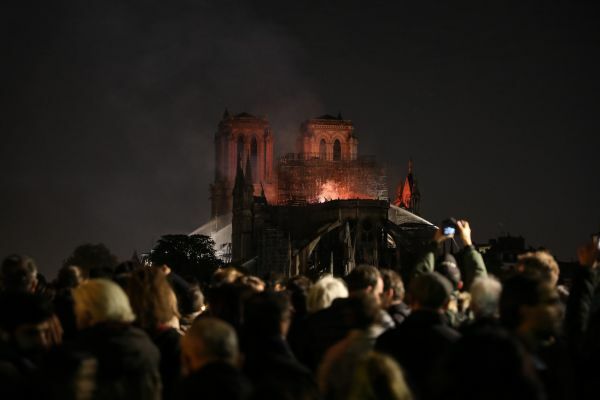 The mayor of Paris, Anne Hidalgo, says she is planning a "major international conference of donors" to raise money for the effort to rebuild Notre Dame Cathedral -- as multimillionaires continue to pledge vast sums towards its reconstruction. The family of Bernard Arnault, the French business magnate who owns luxury goods and fashion house LVMH, has promised to contribute €200 million ($226 million). 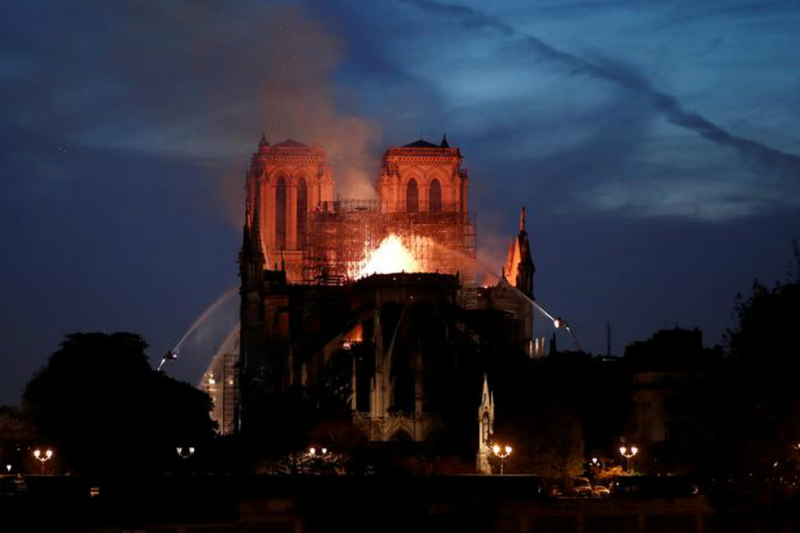 In a statement, the family called Notre Dame an "extraordinary cathedral" and "a symbol of France, its heritage and its unity." 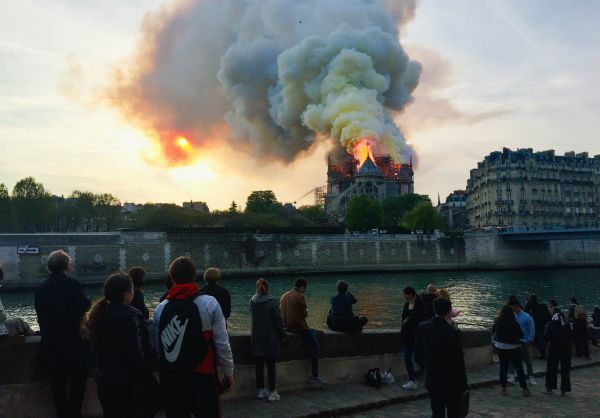 The donation comes after French billionaire François Pinault pledged €100 million ($113 million) to the reconstruction of the fire-ravaged cathedral. Hidalgo said on Twitter that she is ready to host a fundraising event at Paris City Hall, adding that the event would attract patrons from "all over the world." 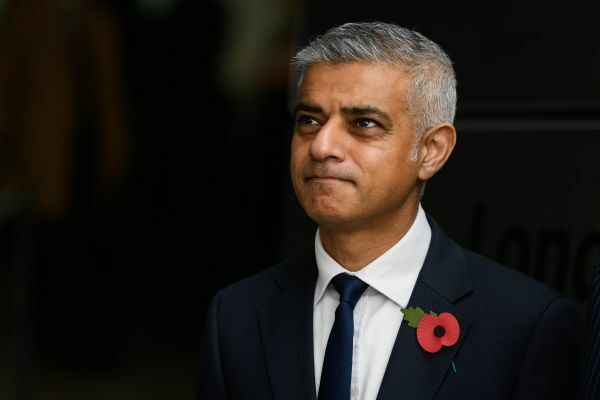 The mayor also said she will mobilize a fund she started for the city in 2015, and noted that the city has a budget of 80 million euros already in place for the restoration of its churches. 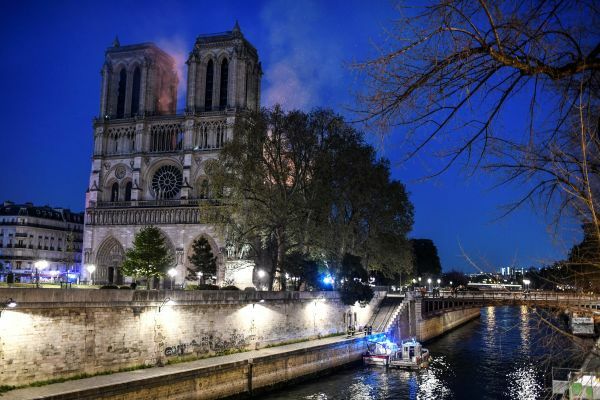 Firefighters have extinguished the fire at Notre Dame Cathedral in Paris, after battling the blaze for nine hours, the city's fire brigade said earlier. Donald Tusk, the President of the European Council, has called on all 28 member states of the European Union to help France rebuild Notre Dame Cathedral. Tusk sent "words of comfort and solidarity" to the country. He referenced his own hometown of Gdańsk in Poland, which suffered heavy bombing during World War II. 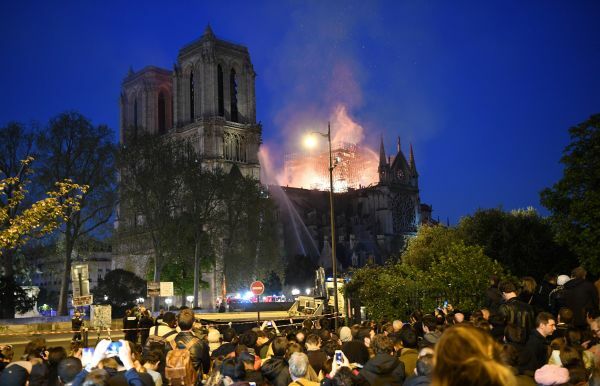 The Paris Fire Brigade has tweeted that the stone construction of the cathedral has been "saved," as have the "main works of art" from the building. In a two-part tweet, the fire service praised the cooperation of "different services" of the state, working together over nine hours to extinguish the inferno at one of Paris' most recognizable landmarks. "The structure of the cathedral is saved and the main works of art have been put somewhere safe, thanks to the combined action of the different services of the State working together." 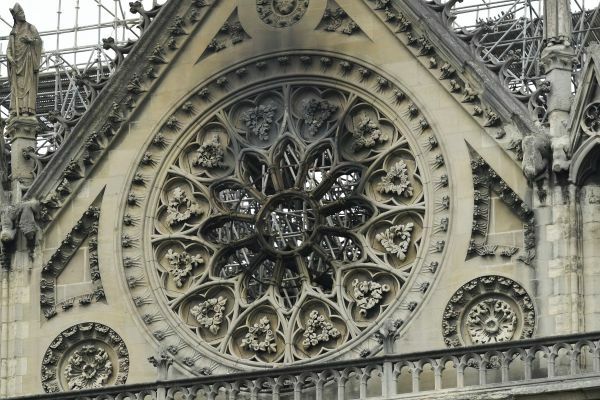 1/2 #Intervention #NotreDame : la structure de la cathédrale est sauvée et les principales œuvres d’art ont été sauvegardées, grâce à l'action combinée des différents services de l'État engagés à nos côtés. "After more than 9 hours of fierce fighting, nearly 400 firefighters from Paris extinguished the appalling fire. 2 policemen and a firefighter were slightly injured," a followup tweet read. 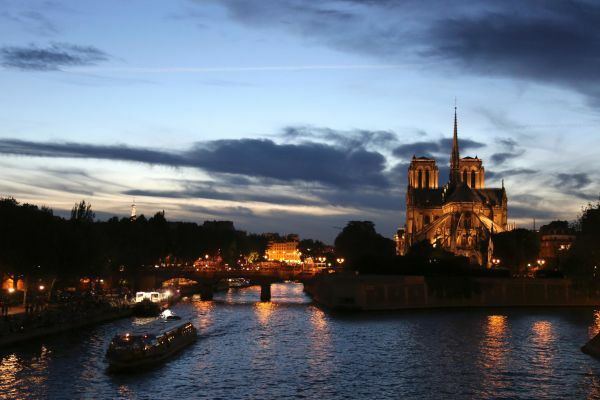 A Twitter user who is in Paris for her honeymoon captured a group of Parisians singing hymns as they walked along a street on the banks of the Seine, close to Notre Dame Cathedral, even as operations to bring the fire under control continued. I heard this outside of my window and found this. Notre Dame is being serenaded. Honestly, it’s more moving than I could describe. 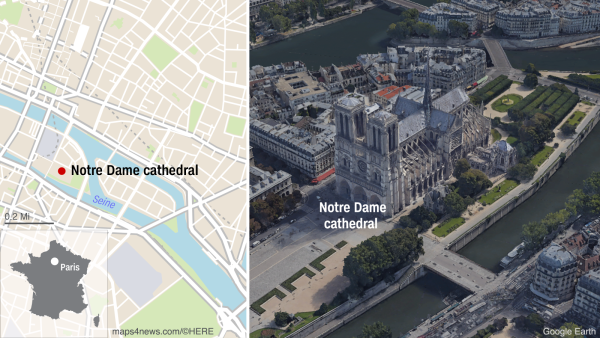 The poster, Jordan Doyle, said that she took the video out of her hotel window, a stone's throw from the famed cathedral, in the early hours of Tuesday morning. "I’m devastated for the people of Paris. I was there on my honeymoon, and I just saw the cathedral for the first time yesterday morning." She said the singing brought her out of her bed. "I opened the window and immediately my eyes welled up. It was beautiful to see people coming together for their city and for Notre Dame. You could honestly feel their sadness. It really felt like they were serenading the building." "They stayed there for a while, singing and applauding. It was surreal." 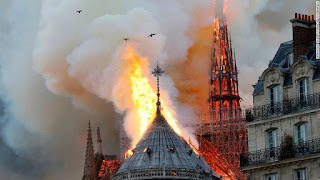 Laurent Nunez, French Secretary of State to the Ministry of Interior told reporters Tuesday morning that the fire which devastated Paris’ Notre Dame Cathedral Monday was "under control" but has not been completely extinguished. "There are still small outbreaks, the cooling off process is still underway, new outbreaks were reported and contained right away," he said. "The risk of fire is now ruled out; now it's about the building, know how the structure will resist to this serious fire last night." 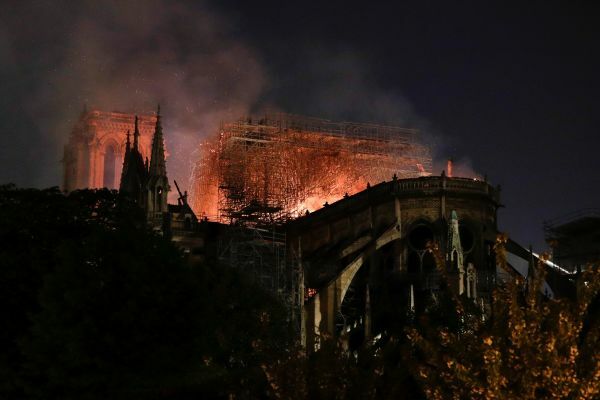 He said that there was a meeting of experts from the French architectural review board "to try and determine if the structure is stable and if the firemen can venture inside and continue their mission." "It was pretty evident in the first 20 minutes that it was going to be a bad fire," said Gregg Favre, a former firefighter with the St. Louis Fire Department in the United States. "Perhaps flying water tankers could be used to put it out. Must act quickly!" Trump said in a tweet. 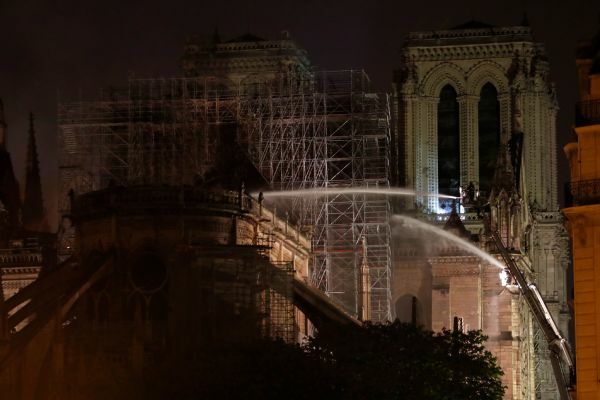 But the French civil security agency, Securite Civile, said in a tweet -- in English, an apparent response to Trump's suggestion -- that any aerial water dumping could "weaken the structure of Notre-Dame and result in collateral damage to the buildings in the vicinity." While countless workers contributed to the building of the 850-year-old cathedral, every architectural detail refers back to a single overarching design concept. But, during its construction, there was also considerable scope for individual expression through the structure’s many ornamental carvings. Their variety provokes almost unfathomable levels of interest, while offering invaluable insight into the way people thought, felt and worked during a crucial period in European history. This playfulness and richness of expression has long been recognized as one of the great hallmarks of Gothic architecture. Find out more about this historic work of architecture, and why its loss is so tragic, here. What makes Notre Dame so iconic? The central Paris cathedral, which celebrated its 850th anniversary in 2013, took 182 years to build -- construction began in the 12th century and was completed in the 13th century -- and can hold more than 6,000 worshipers. Notre Dame was badly damaged during the French Revolution, and was restored by architect Eugène Viollet-le-Duc in the 19th century. It is known for its enormous stained glass windows, among other remarkable architectural details. Learn more about this remarkable building here. She said that she and other Parisians were finding it "very hard today -- (Notre Dame is a) very important monument... it’s very heartbreaking." "It’s not just about the church, it’s a monument, the identity of people here. It’s the heart and soul of Paris. It’s very hard to see it (burn down)." "Everyone was terrified, we didn’t really know what was happening." Authorities have since said that they are working under the assumption that the blaze was unintentional. Widawska told CNN's Don Lemon that it was devastating to see the damage wrought on the centuries-old structure. "Everyone was very sad, people started to cry, it was a very emotional moment," she said. "It was like losing someone, you have seen on the faces of people it was like fear and sadness, they know something very bad was happening." Retired FDNY deputy chief Jim Bullock told CNN’s Don Lemon that churches, particularly cathedrals, are especially susceptible to fires. 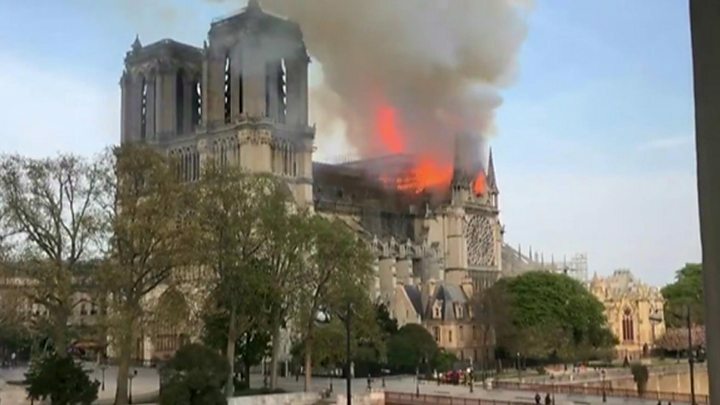 "It’s old wood that is dry and burns fast, and there’s a lot of wood in that building," he said of the Notre Dame Cathedral, which was ravaged by a huge fire Monday. Notre Dame's ceiling has been described as a "forest," thanks to the amount of wood that was used in its construction. Some of it is hundreds of years old, and tinderbox dry. "Churches have their own problem, especially large cathedrals," he said. "There's a large open-air space, so there's lots of air to feed the fire (along with) a lot of combustible stuff in the ceiling. And once (the fire's) in the ceiling it's hard to get up there -- it could be 300 feet in the air." He says that as there were renovations underway in the 850-year-old church, some artifacts had been removed from the building, meaning that fewer relics may have been lost than might otherwise have been the case. Travelers from all over the world shared cherished memories of their visits to one of the most beloved religious structures in the world with CNN. One visitor, Natalie Esparza, 35, from Detroit, first went to the world-famous building in 2000 and was "absolutely spellbound." "Outside of its religious connotations, it stands for the progress of man. Its lasting historical value to what we can accomplish in our artistic and mathematical endeavors will not be matched." Another visitor, 64-year-old Rona Moody, from Scotland, first came in 1974 to celebrate the end of her freshman year of college. 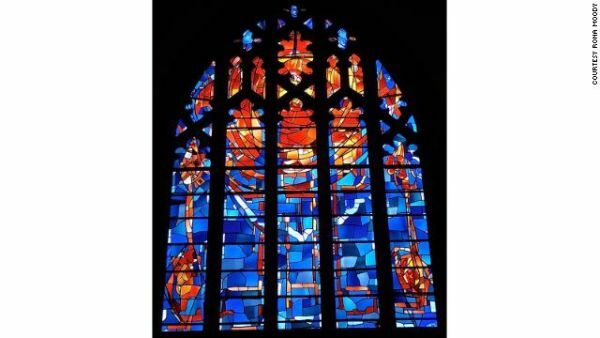 She was inspired by the art inside the cathedral, and is now a stained glass artist in Pennsylvania. Click or tap here to read more of their stories. 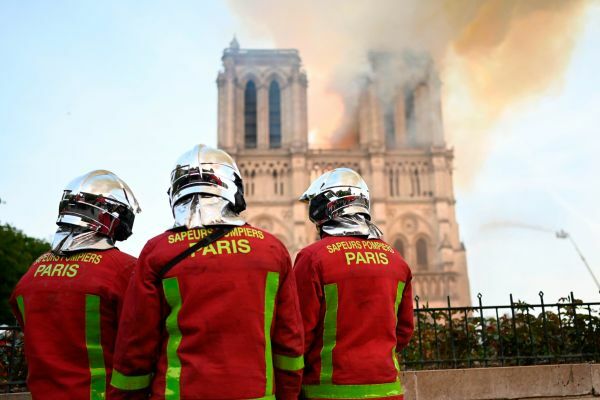 Some of the 400 firefighters who had been deployed to fight the massive blaze at Notre Dame Cathedral are leaving, to applause from the gathered crowds, according to CNN's Nic Robertson, who is on site at the devastated cathedral. It is thought that the fire, which broke out Monday evening, was started unintentionally, Robertson said. There is renovation work going on at the 850-year-old church, but it is not clear if the fire was connected to the renovation work. A YouTube feature designed to combat misinformation linked the fire at Notre Dame Cathedral to the September 11 terrorist attacks. 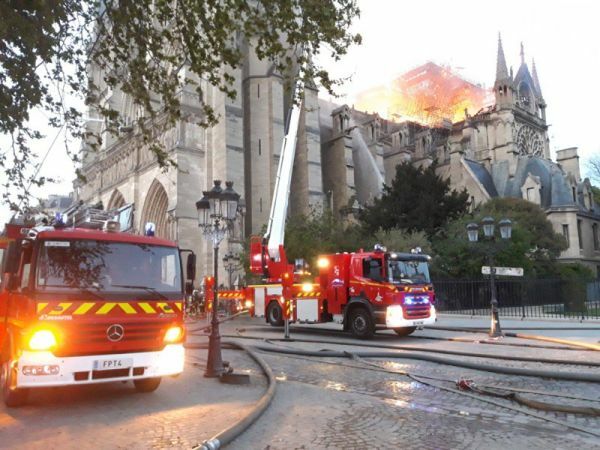 The fire broke out in the 12th-century cathedral in the center of Paris Monday evening. The cause of the devastating blaze, which brought down the 19th century spire, is currently unknown. A label with a paragraph pulled from the Encyclopedia Britannica displayed background information about the 2001 September 11 terrorist attacks underneath multiple YouTube livestreams of the fire, including those posted by NBC News, CBS News, and France 24. 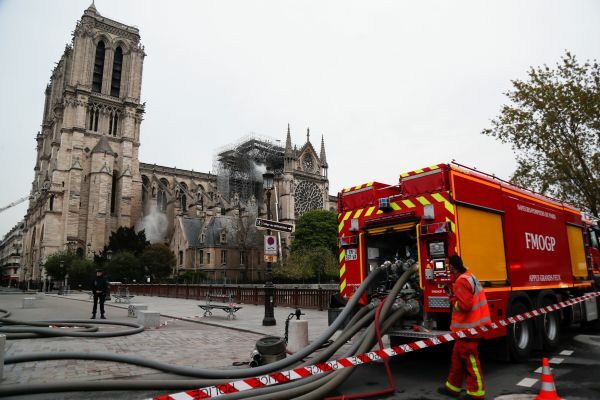 The company blamed the mix-up on its algorithms, and removed the links on all Notre Dame fire posts after the issue was flagged. CNN affiliate BFMTV reports that the family of French billionaire François Pinault has pledged €100 million ($113 million) to the reconstruction of the fire-ravaged cathedral. 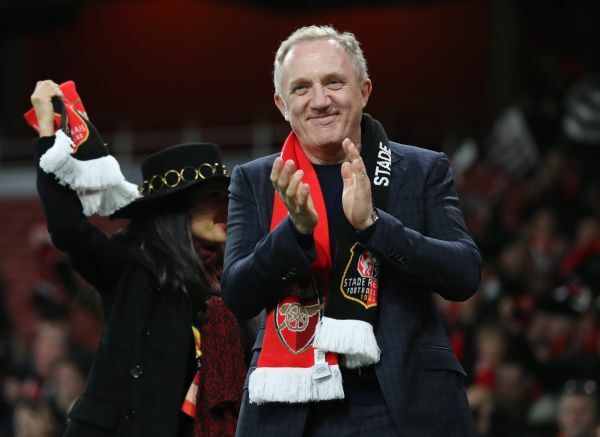 Pinault's son, François-Henri Pinault, who is president of the Artemis Group holding company, called the massive blaze at Notre Dame a tragedy that impacts all of France. 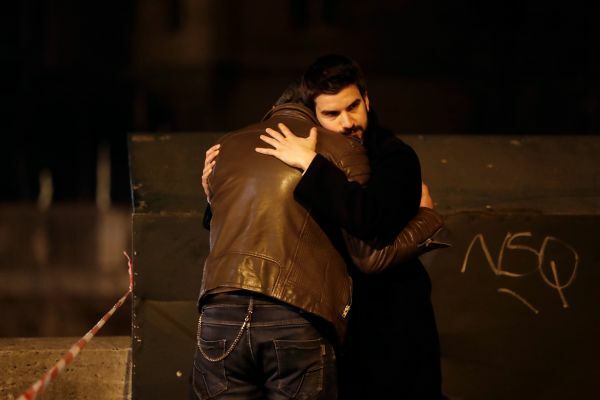 "This tragedy strikes all the French, and well beyond that, all those dedicated to spiritual values," he said in a statement to French news agency AFP. "Faced with such a tragedy, everyone wishes to revive this jewel of our heritage as quickly as possible." The family's holdings include luxury brands Gucci, Bottega Veneta, Balenciaga and Alexander McQueen, as well as auction house Christie's. Video released by France's Ministry of the Interior on Facebook shows the lengths that Paris' firefighters went to battle the enormous blaze, and the extent of the fire itself. Drone footage seen in the video (at around the 1 minute 23 second mark) shows exactly how intense -- and widespread -- the fire was, from above the cathedral. The cathedral has been a symbol of Catholicism and French identity for over 850 years. Its foundation stone was laid in 1163 by Pope Alexander III, and the cathedral was completed in the 13th century. Today, with its towers, spire, flying buttresses and stained glass, Notre Dame is considered a feat of architecture, as well as a major religious and cultural symbol of France. 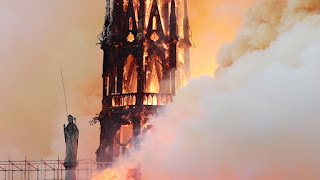 Its central spire, which tragically collapsed Monday in the blaze, was built in the 19th century amid a broad restoration effort, partly buoyed by the success of Victor Hugo's novel "The Hunchback of Notre Dame" in 1831. The cathedral draws millions of visitors. Located in Île de la Cité, a small island in the middle of the city, the cathedral is one of Paris' most popular attractions, drawing an estimated 13 million visitors a year. A drawing by architect and artist Cristina Correa Freile has captured how many people are feeling in the aftermath of Monday's devastating fire. Her sketch, showing Quasimodo from Disney’s "Hunchback of Notre Dame," based on Victor Hugo's novel, has been widely shared on social media. Correa Freile says she was inspired to create this drawing of the character hugging the cathedral after hearing about the fire. The artist lives in Ecuador, but has visited Paris twice and loved it. 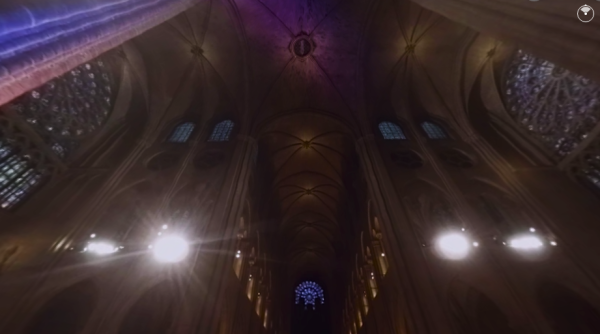 CNN shot inside the famous Paris cathedral in VR back in 2015 -- click or tap here to view Notre Dame's awe-inspiring interior. 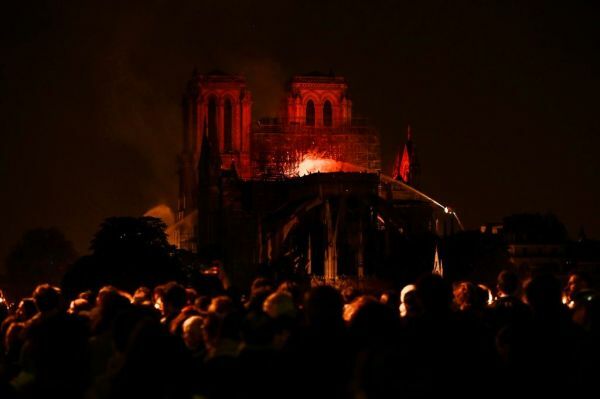 In a time of heightened political, religious and sectarian divisions, a fire in a Catholic cathedral in France brought the world together in shared sorrow, writes CNN's world affairs columnist, Frida Ghitis. “The massive, majestic cathedral looked like it had been there forever, and would remain until the end of time. If only for a moment, Notre Dame ablaze reminded us that we all share this world; that human history means everyone's past," Ghitis, a former CNN producer and correspondent, writes. Click or tap here to read the whole piece. A spokesman for Paris police tells CNN the Notre Dame fire is now under control. 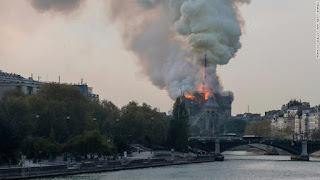 Paris Mayor Anne Hidalgo said in a tweet that major art pieces and sacred items from Notre Dame were saved from the fire. Merci aux @PompiersParis, aux policiers et aux agents municipaux qui ont réalisé ce soir une formidable chaîne humaine pour sauver les œuvres de #NotreDame. La couronne d'épines, la tunique de Saint Louis et plusieurs autres œuvres majeures sont à présent en lieu sûr. The cathedral is home to numerous artifacts, works of art and religious relics, each telling a story. After the devastating fire tore through the cathedral on Monday, toppling its spire, many feared the items -- collected over the centuries -- might be lost. It was unclear how many had been saved. 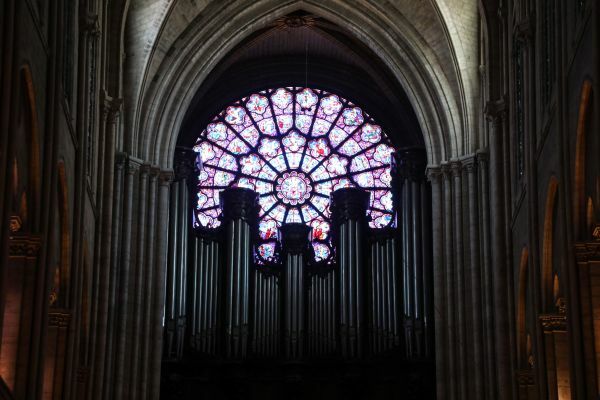 Click here to take a look at some of the most famous items that the Paris cathedral is home to, including several sacred artifacts, including the Crown of Thorns, a fragment of the "true cross" on which Jesus was crucified, and one of the nails used by Romans to crucify Christ. 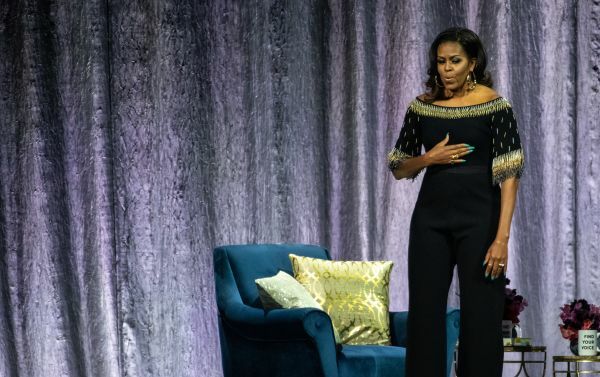 Michelle Obama: Cathedral gives us "a higher understanding of who we are"
The former US first lady, who is in Paris for her book tour, has tweeted about the "majesty" of the cathedral, which is one of the city's most recognizable and visited attractions. Michelle Obama writes that the "history, artistry, and spirituality" of the famed cathedral "took our breath away, lifting us to a higher understanding of who we are and who we can be." She signaled her commiseration with the people of Paris, but expressed confidence that it would soon be rebuilt, to "awe us again." The majesty of Notre Dame—the history, artistry, and spirituality—took our breath away, lifting us to a higher understanding of who we are and who we can be. Being here in Paris tonight, my heart aches with the people of France. Yet I know that Notre Dame will soon awe us again. While the cathedral's two towers were saved, its spire collapsed in the massive blaze that engulfed the world-famous building. Watch the moment it came down here. Archbishop: Fire "goes beyond Paris"
The fire at Notre Dame Cathedral “goes beyond Paris,” Archbishop Michel Christian Alain Aupetit told CNN. “The young people behind me show the power of faith, the power of a message of peace,” the Paris archbishop added. 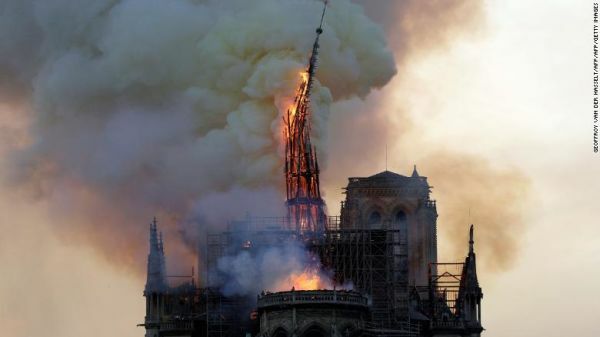 Turkish FM: Fire "a disaster for all humanity"
Foreign Minister Mevlut Cavusoglu said Turkey is following news of the fire at Notre Dame cathedral in Paris with “great sadness,” according to his official Twitter page. “The destruction of this architectural masterpiece of world heritage is a disaster for all humanity,” Cavusoglu wrote in French on the social media site. 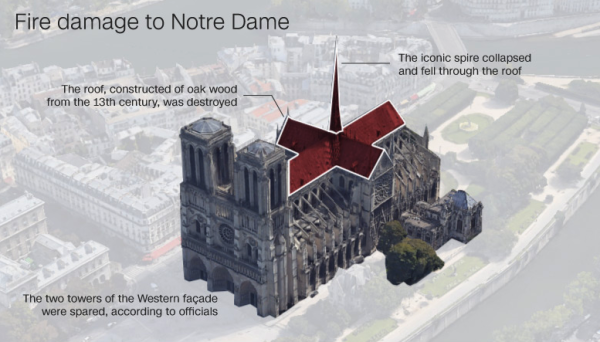 Notre Dame’s medieval roof structure, known as "the forest," has been lost to the massive fire, according to Msgr. Patrick Chauvet, the rector of the cathedral. “The framework from the 13th century is called a forest, because it required a forest of trees to build it,” he said. 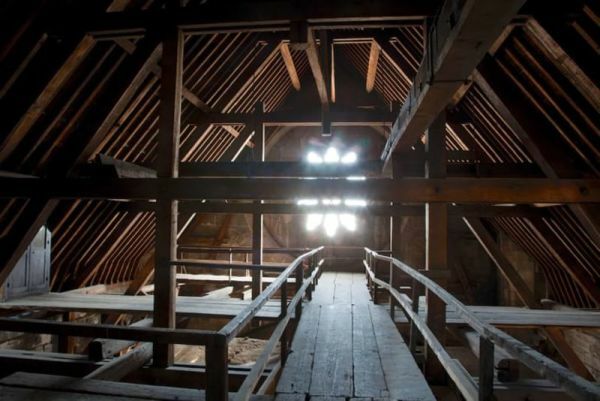 The cathedral's wooden frame, which primarily consists of oak, contains beams that date as far back as the first frame. It features trees cut down between 1160 and 1170, forming one of the oldest parts of the structure. Most of the current frame dates from the year 1220, according to the church's website. 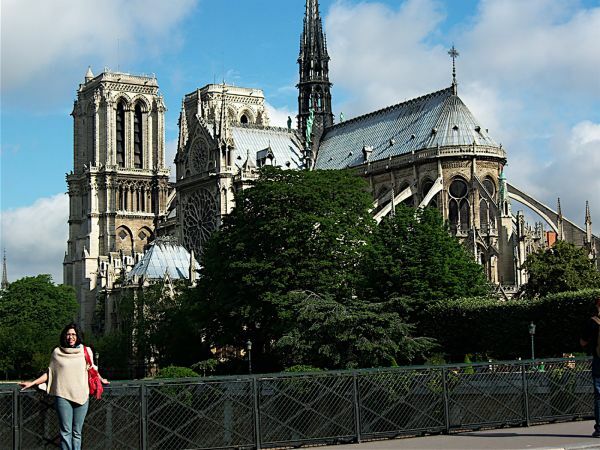 According to the Notre Dame website, it’s one of Paris’s oldest frameworks. Learn more about the construction of the famous cathedral here. Joe Biden tweets, says cathedral will "rise again"
Former vice president and potential 2020 Democratic hopeful Joe Biden tweeted his thoughts on the blaze, which consumed large sections of the cathedral. "For centuries, Notre Dame Cathedral has withstood wars, revolutions, and the test of time," the tweet reads, noting that the devastating fire occurred during Holy Week, the holiest week of the Catholic calendar. Biden calls it "a symbol of faith & a testament to history," adding that he believes it will be reconstructed, to "rise again." The Paris prosecutor’s office has opened an investigation into the devastating fire at Notre Dame Cathedral, a spokesperson told CNN on Monday. Prosecutors will be investigating an "involuntary destruction by fire,” the spokesperson said. 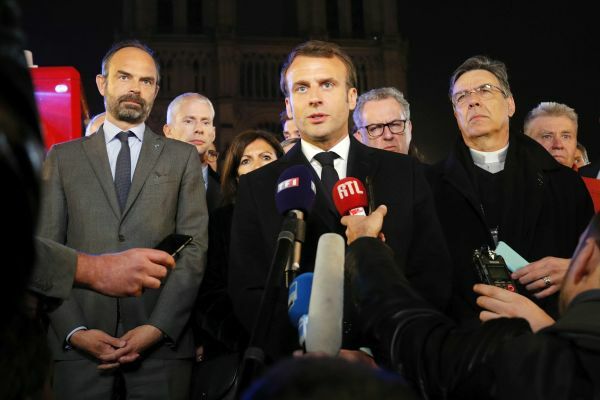 French President Emmanuel Macron: "We will rebuild this cathedral together"
French President Emmanuel Macron just announced that, starting Tuesday, he will launch an international fundraising campaign to rebuild the Notre Dame Cathedral. 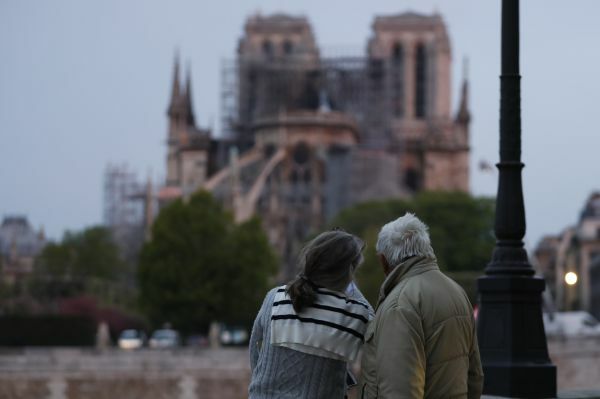 French-American François-Xavier Lochet, 70, was attending Mass at Notre Dame Cathedral on Monday when a loud alarm went off just as the congregation began the Universal Prayer -- it was so loud Lochet could barely understand the messages in French and English. Most of those who heard it, however, just stood there as visitors began to be ushered out of the cathedral. That was until, Lochet said, a police officer approached a priest and told him, "This is no joke. You've got to get out." Lochet began walking back to his mother's home when he turned around and saw smoke. "Nobody was paying attention," he said. "I stopped and I took my phone out and I waited." Soon, smoke began billowing out from the cathedral. "To me. I felt like crying," he said. "This is my most favorite church probably in the world. To me, as a kid, I climbed the towers when I was 12 years old." He could not help but think about the countless craftsmen who devoted their entire lives to constructing the church, even those who helped renovate it. He'd often go to Mass, or just to listen to the cathedral's organs. "It's a huge piece of history of Europe," he said. "Gone." 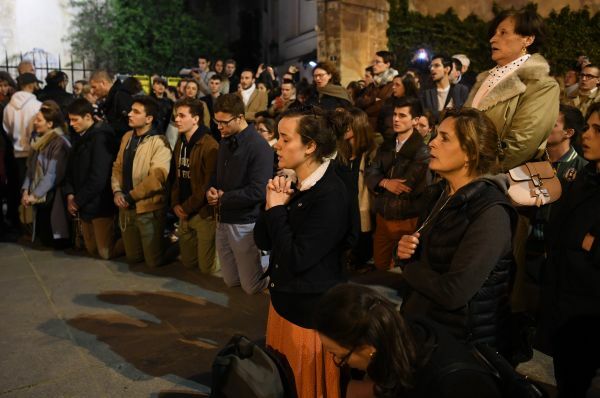 It's past 11 p.m. in Paris, but the crowds of Notre Dame mourners haven't gone anywhere -- many are still gathered outside the cathedral, praying and singing hymns. Some are on their knees; at one point, a group broke out in a haunting rendition of the "Ave Maria." They have been singing for almost two hours now, and the hymns are getting louder as more people join in. 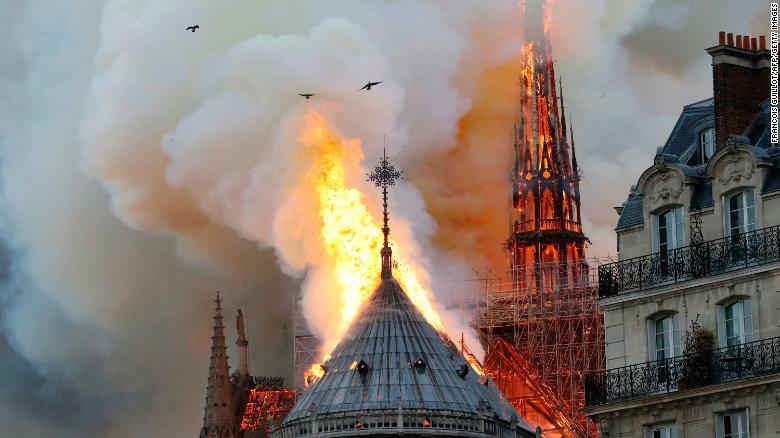 Both towers of the Notre Dame Cathedral “are safe,” said Laurent Nunez, secretary to the interior minister, hours after a massive fire toppled its spire, burned most of its roof and threatened the centuries-old art and architecture inside. “The fire is now weaker. We are now in a time of cooling but both towers of the cathedral are safe. 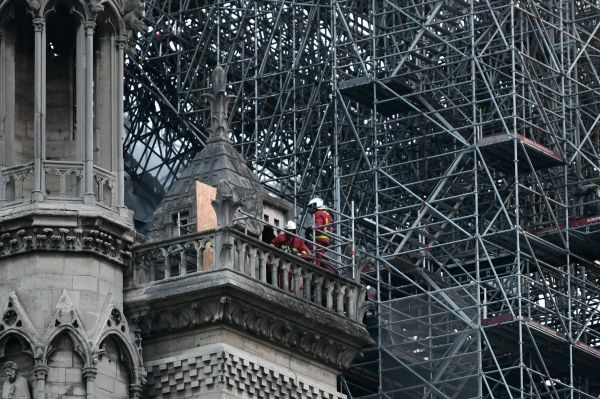 We're still working to save the cathedral's work of arts," Nunez told reporters at the scene. For generations, Notre Dame has been a place of pilgrimage and prayer, and, even as religion in France has declined for decades, it remained the beating heart of French Catholicism, open every day for Mass. About the cathedral: Notre Dame is not a parish church, meaning that it does not have a regular body of worshippers who "belong" to the church. But it is still the home church of Paris Archbishop Michel Aupetit, and draws Catholics for vespers (evening prayers), Masses and the Sacrament of Reconciliation, also known as Penance. And every year during Holy Week, Notre Dame unveils some of the most coveted relics in Christendom. 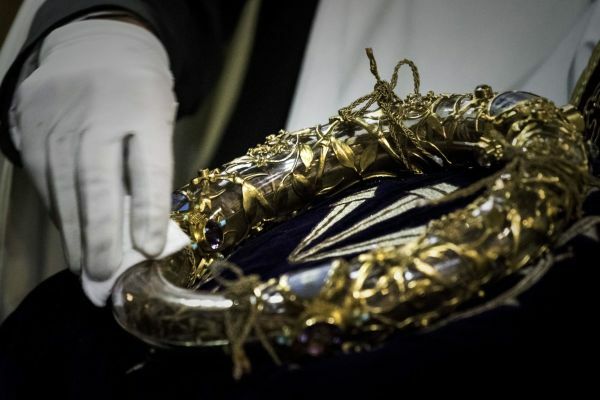 Among them is the Holy Crown, believed by many to be from the crown of thorns placed on the head of Jesus. 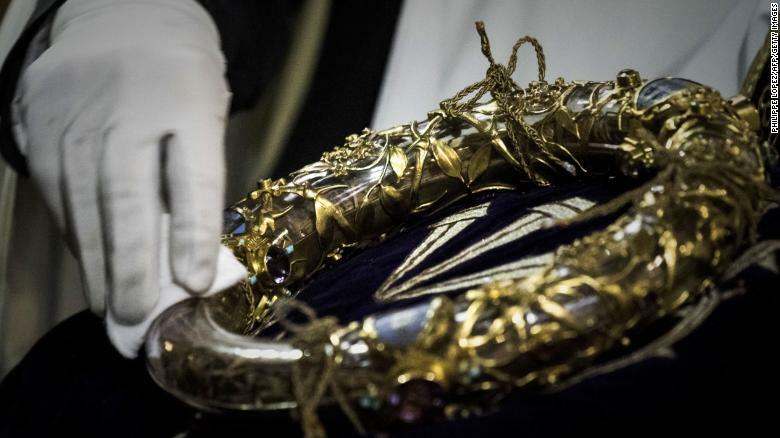 Catholics have prayed with the Holy Crown for more than 16 centuries, according to the cathedral. Notre Dame counts among its treasures two other relics connected to Holy Week: a fragment of the Wood of the Cross, believed by many to be a part of the "true cross" on which Jesus was crucified; and one of the nails that the Romans used to crucify Jesus. Former US President Barack Obama just tweeted about the destructive fire at Notre Dame Cathedral in Paris. "Notre Dame is one of the world’s great treasures, and we’re thinking of the people of France in your time of grief. It’s in our nature to mourn when we see history lost -- but it’s also in our nature to rebuild for tomorrow, as strong as we can," he said. UN chief: "Horrified by the pictures coming from Paris"
UN Secretary-General António Guterres said he is "horrified" to see the images coming out of Paris. "Horrified by the pictures coming from Paris with the fire engulfing Notre Dame Cathedral — a unique example of world heritage that has stood tall since the 14th century," Guterres said in a tweet. "My thoughts are with the people and government of France." 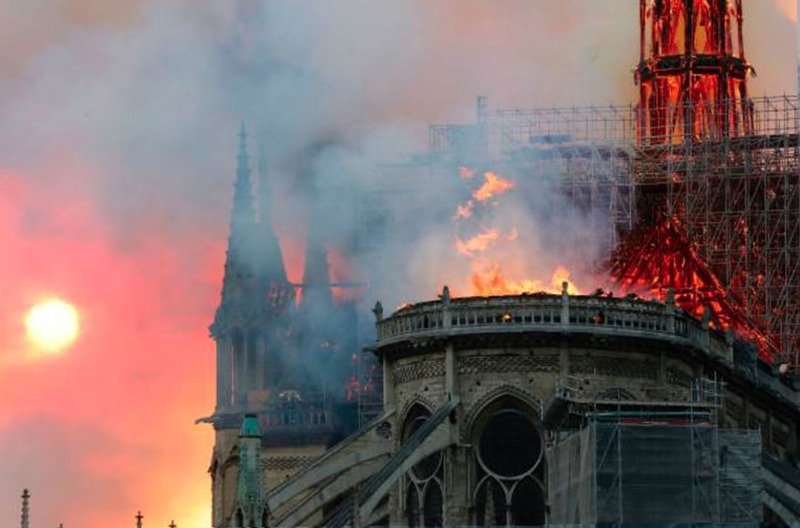 Horrified by the pictures coming from Paris with the fire engulfing Notre Dame Cathedral - a unique example of world heritage that has stood tall since the 14th century. My thoughts are with the people and government of France. “We need to win this battle and block the spreading of the flames. The most efficient action is from the inside. We are not sure if we will be able to stop the spreading of the flames to the North Tower," he said. He said the initial call to emergency services notified authorities of a fire in the attic of the cathedral, although the cause of the blaze is unknown. “We are evacuating the most precious artwork that is being sheltered,” Gallet said. 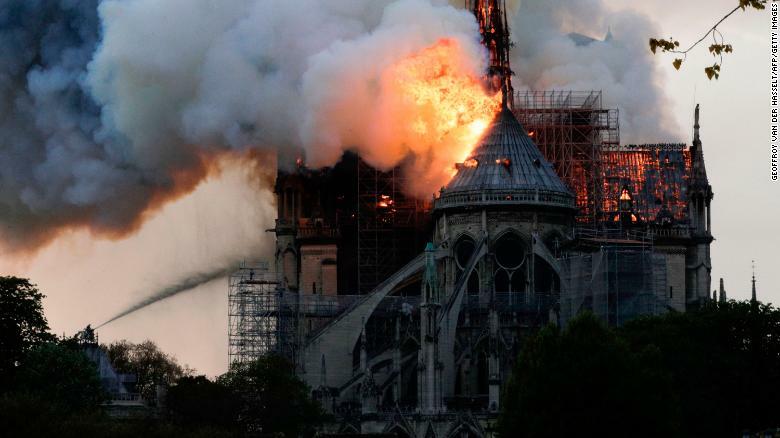 The spire atop the iconic Notre Dame cathedral in Paris collapsed Monday evening during a massive blaze. 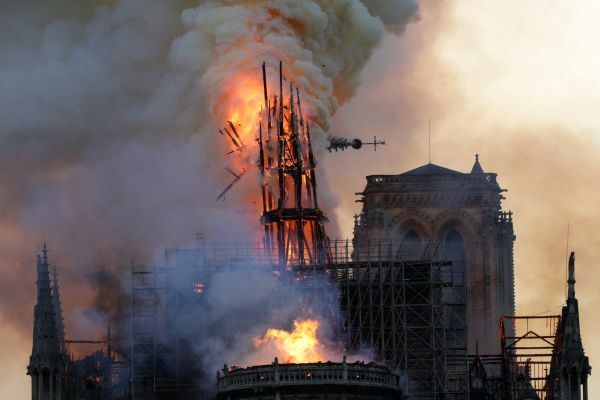 The flaming spire, which was surrounded by scaffolding, leaned to one side and then collapsed onto the burning roof. 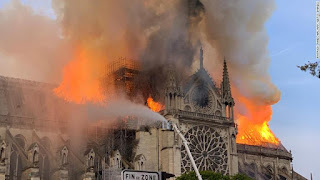 The fire rapidly spread and took over the iconic cathedral. The collapse drew gasps from a crowd watching nearby. They were joined by somber people who had come to recognize the landmark as a symbol of Paris. The cathedral: Notre Dame's foundation stone was laid in 1163 by Pope Alexander III, and the cathedral was completed in the 13th century. 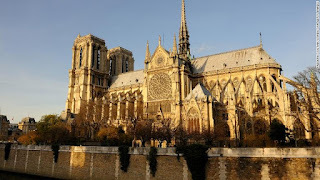 Today, with its towers, spire, flying buttresses and stained glass, Notre Dame is considered a feat of architecture, as well as a major religious and cultural symbol of France. The central spire: It was built in the 19th century amid a broad restoration effort, partly buoyed by the success of Victor Hugo's novel "The Hunchback of Notre-Dame" in 1831. The cathedral draws millions of visitors: Located in Île de la Cité, a small island in the middle of the city, the cathedral is one of Paris' most popular attractions, drawing an estimated 13 million visitors a year. The Vatican expresses "shock and sadness"
Theresa May: "My thoughts are with the people of France"
French government agency responds to Trump's suggestion of using "flying water tankers": That could collapse the "entire structure"
The French civil security agency, Sécurité Civile, has responded to US President Donald Trump’s suggestion that “flying water tankers” should be used to fight the Notre Dame fire. 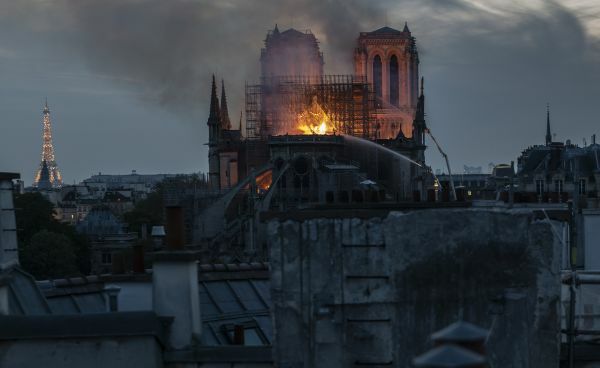 “The weight of the water and the intensity of the drop at low altitude could indeed weaken the structure of Notre-Dame and result in collateral damage to the buildings in the vicinity,” it said. The civil security agency is part of the Interior Ministry. 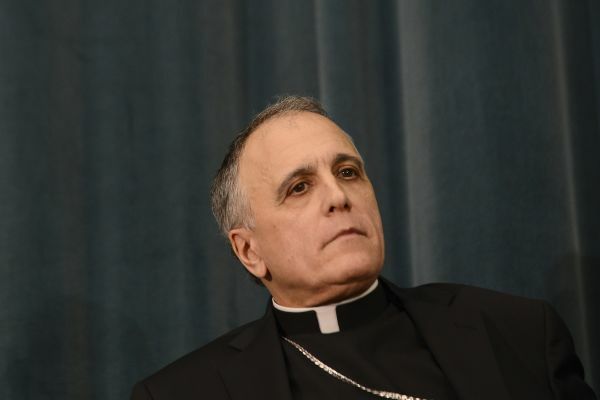 US bishops conference: Notre Dame is "a world treasure"
Cardinal Daniel DiNardo, the president of the US Conference of Catholic Bishops, shared his shock and sadness, calling the cathedral "a world treasure." 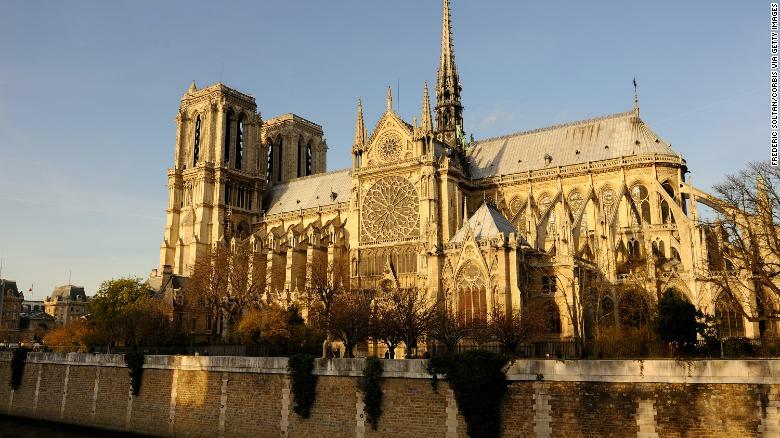 In a statement to the people of Paris, DiNardo said the cathedral has "long been a symbol of the transcendent human spirit as well as our longing for God." As evening falls in Paris, crowds are still gathered near Notre Dame as the historic cathedral burns. A witness earlier in the day had described an eerie silence; now, the crowd has begun to sing hymns together, many on their knees. "I was walking home with a colleague. We were walking (on) Rue des Carmes. And we saw the smoke. I couldn’t stop staring at it, so I took some pics. When the spire fell, the crowd reacted with 'ohhh' and 'ahh,' but I guess most of them were just shocked, silently. It’s awful to see such a symbol disappearing in front of you. It’s been there for so many years and in a few minutes half of it disappears... crazy. Paris without Notre Dame...madness." 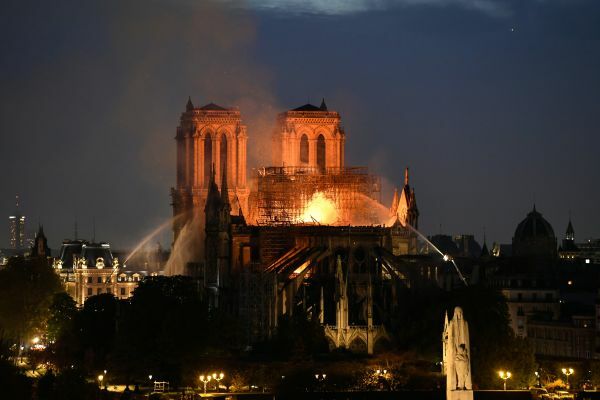 The French Interior Ministry said 400 firefighters have been mobilized to deal with the Notre Dame blaze. The cathedral's iconic spire collapsed earlier this evening. The central spire was built in the 19th century amid a broad restoration effort, partly buoyed by the success of Victor Hugo's novel "The Hunchback of Notre-Dame" in 1831. 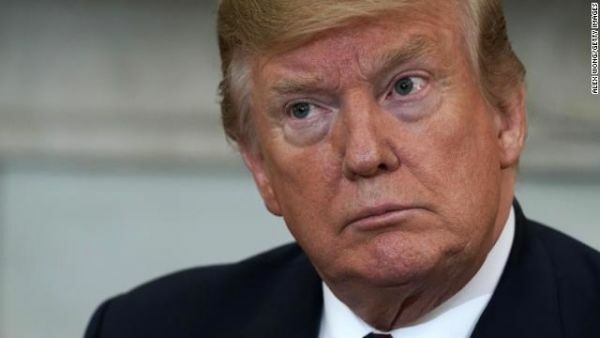 President Trump on the "terrible, terrible fire"
US President Donald Trump said Notre Dame's famous cathedral was struck by a “terrible, terrible fire." “When we left the plane, it was burning at a level that you rarely see a fire burn,” he said, referring to his trip from Washington to Minnesota for a tax-day roundtable with business leaders. The President lamented the damage to the historic cathedral. He said the fire would put “a damper” on the tax roundtable he was about to begin. Patryk Bukalski was at a café near the Notre Dame Cathedral when he started smelling smoke. 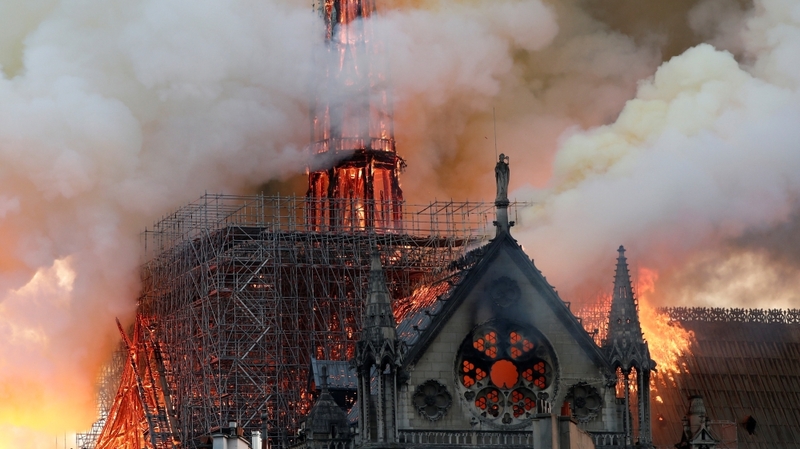 “A bartender said the Notre Dame is on fire, so I left and saw this horrible picture,” he told CNN over Instagram, where he posted a video of the burning cathedral. At the scene: It is eerily quiet. Hundreds of people are lining the Seine watching the fire, but they are silent. Police have pushed people back, even telling residents they can’t go to their homes. “In Paris, it’s a monumental symbol -- every person with different religions are really moved and saddened," said another witness named Anne Marie, speaking with tears in her eyes. "Paris without the cathedral is not Paris anymore," she said. French President Emmanuel Macron has arrived at the historic Notre Dame Cathedral, where a fire rages on. He was accompanied by Mayor Anne Hidalgo, Prime Minister Edouard Philippe and first lady Brigitte Macron, as well as the Paris prosecutor. 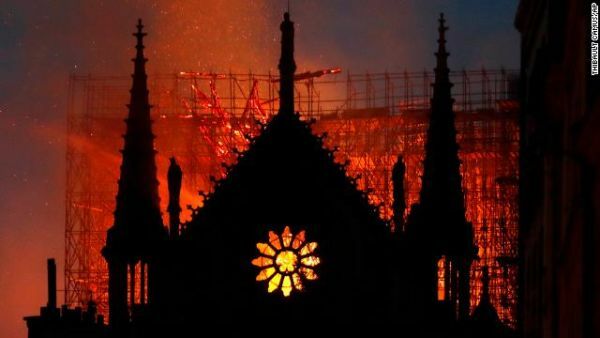 Witness Elaine Leavenworth said ash and embers were falling from the sky as a fire tore through the iconic Notre Dame Cathedral in Paris. Leavenworth said she felt droplets of water as firefighters worked to douse the flames. The Paris prosecutor has opened an investigation into the Notre Dame fire, a spokesman tells CNN. 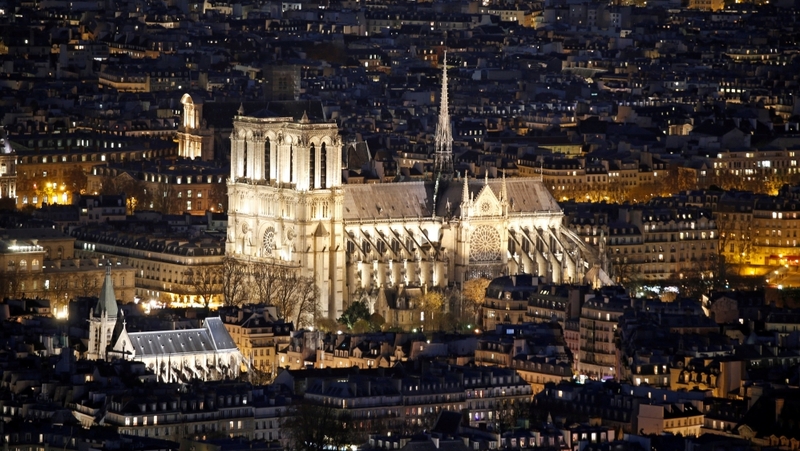 The fire broke out Monday evening at the iconic cathedral in the heart of Paris. As the spire of the Notre Dame cathedral collapsed, there were horrified gasps from the watching crowd. Sirens blare in the background, as emergency personnel work to put out the flames. Mike Pence on Notre Dame fire: "It is heartbreaking to see a house of God in flames"
US Vice President Mike Pence just tweeted about the ongoing Notre Dame fire. 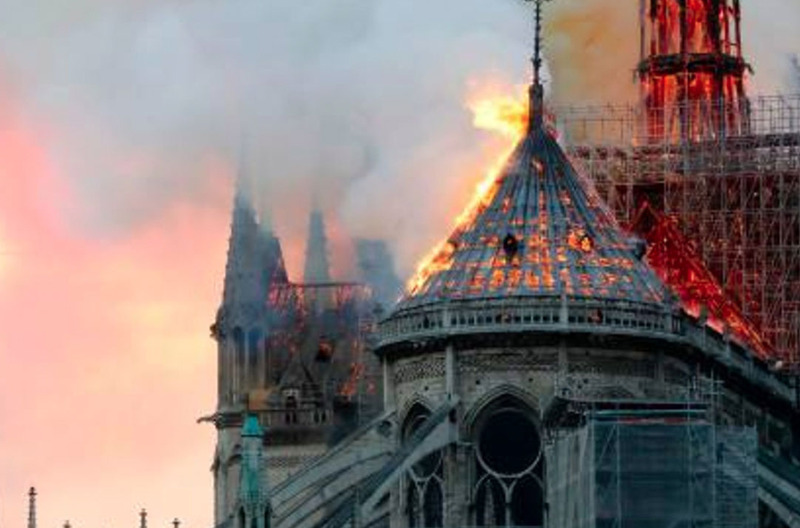 "Notre Dame is an iconic symbol of faith to people all over the world – and it is heartbreaking to see a house of God in flames," he tweeted. 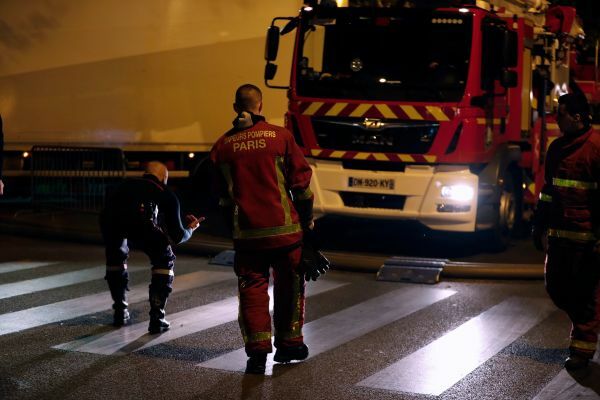 "Our thoughts and prayers are with the firefighters on the scene and all the people of Paris." Notre Dame is an iconic symbol of faith to people all over the world – and it is heartbreaking to see a house of God in flames. Our thoughts and prayers are with the firefighters on the scene and all the people of Paris. Witness: "It’s tremendously sad to see this happening to such an iconic monument"
"My roommate told me to come see it. I’m not sure when it started. I’m really not sure what to think. It’s tremendously sad to see this happening to such an iconic monument. The fire has been slowly spreading across the roof. I’m really not sure what to make of this yet." 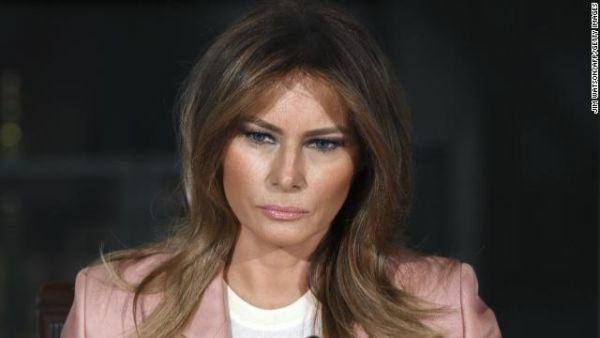 First lady Melania Trump took to Twitter to offer her prayers for "everyone's safety" as a fire continues to rage at Notre Dame cathedral in Paris. "My heart breaks for the people of Paris after seeing the fire at Notre Dame Cathedral," she said. 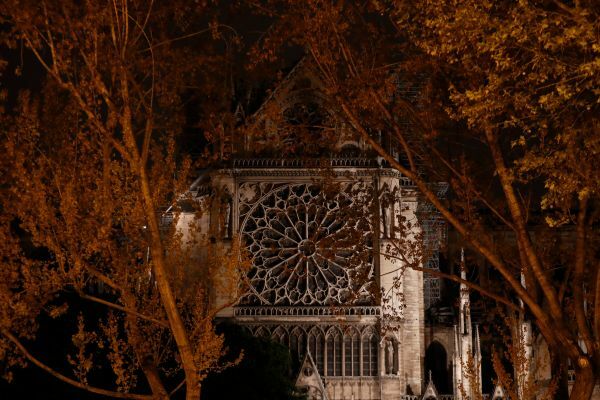 French President Emmanuel Macron just tweeted about the Notre Dame fire, saying that he was "sad tonight to see this part of us burn." "Notre Dame of Paris in flames. 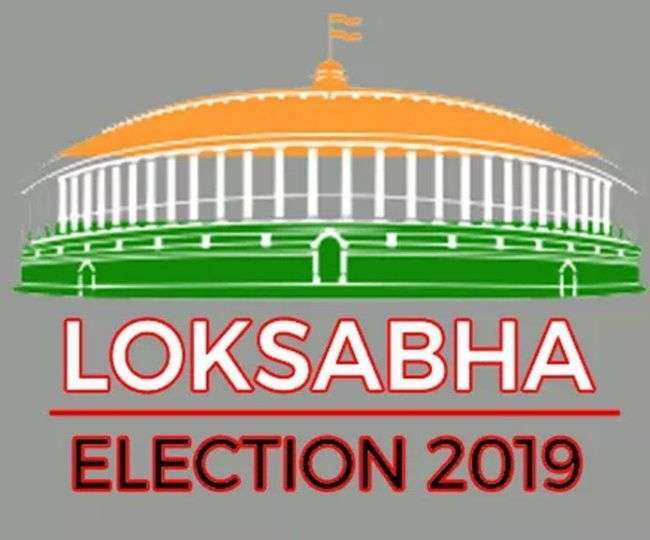 Emotion for a whole nation. Thoughts for all Catholics and for all French. Like all our countrymen, I'm sad tonight to see this part of us burn," he said.